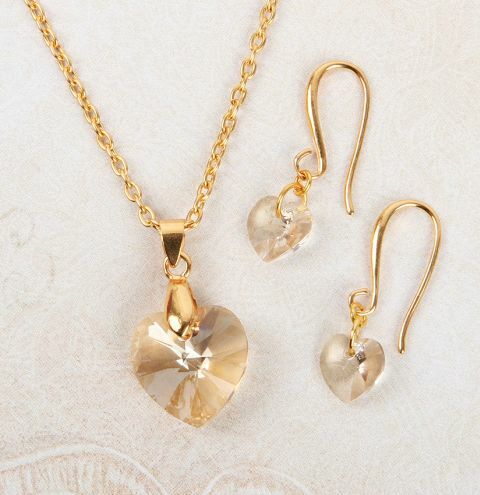 Make the perfect gift for Mother's day with Swarovski crystal Golden Shadow love hearts charms! See more Swarovski crystal hearts. Open the bail and close it onto your large Swarovski heart. Cut the chain to 18 inches or your desired length, attach a jumpring to each side and a clasp onto one of the jumprings. To make the earrings, open a small jumpring and attach it to the earwire loop and a larger jumpring. Open the larger jumpring and link it through the smaller Swarovski heart. Repeat to make your second earring.